UN Special Rapporteur on contemporary forms of racism urged the Government of Argentina to take urgent measures to protect and promote the rights of indigenous peoples who have been subject to the invisibility, marginalization and systematic exclusion for a long time. The Special Rapporteur conducted his official visit to Argentina from 16th to 23th May. The preliminary conclusion is available at the OHCHR website. IMADR Latin America Base has been supprotng indigenous Mapuche, Toba/ Qom peoples, Afro-descendants and migrant workers to uphold their rights. 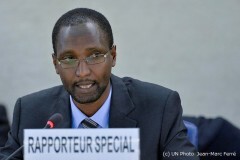 BUENOS AIRES / GENEVA (24 May 2016) – The United Nations Special Rapporteur on racism, Mutuma Ruteere, today urged the Government of Argentina to take urgent measures to sustainably address the invisibility, marginalization and systematic exclusion of indigenous peoples, one of the most vulnerable group in the country. The human rights expert’s appeal comes at the end of his first official visit* to Argentina, from 16 to 23 May, to assess the situation of indigenous peoples, peoples of African descent, migrants from the region and beyond, and other groups. “Argentina has developed a comprehensive legal framework for the elimination of racial discrimination and the equal enjoyment of rights for all inhabitants, whether Argentine or foreign,” he noted. He also welcomed existing laws to protect specific vulnerable groups such as the indigenous peoples, as well as efforts made to acknowledge the existence of Afro-Argentines through a series of symbolic measures. “I acknowledge Argentina’s progressive migration law that recognizes migration as a fundamental inalienable right, and the establishment of a number of institutions aiming at promoting human rights and anti-discrimination such as the National Institute Against Discrimination, Xenophobia and Racism (INADI),” he said. However, the human rights expert also underscored that, despite the existing comprehensive legal and institutional framework, effective implementation is lacking and significant challenges persist. “The situation of indigenous peoples in certain areas of the country is appalling as they live in extreme poverty, socio-cultural isolation and without access to basic services such as adequate health, descent housing or even drinkable water,” Mr. Ruteere said while calling on the Argentine authorities to develop a comprehensive multi-sectorial national strategy to address the rights of indigenous peoples and other groups subjected to discrimination. “Most alarming are the reported trends of repression, in several parts of the country, against the mobilization by indigenous groups to claim their rights; and the reprisals against minority rights defenders and leaders as well as members of their families,” the independent expert said. “I have heard reports of police profiling and violence against migrants from neighboring countries and beyond and that those acts remain unpunished and investigations of such crimes are seldom conduct,” he explained, and noted that the absence of an effective migrant integration polices further contributed to the marginalization and stigmatization of this group. The rights expert recommended implementing affirmative action measures to enable the representation of minority groups in positions of influence such as in education including university level, judiciary, legislatures and executive positions.